The “Can Do” Kids were excited to see that Miss Pat decorated the classroom with dinosaurs for Dinosaur Show and Tell Day. 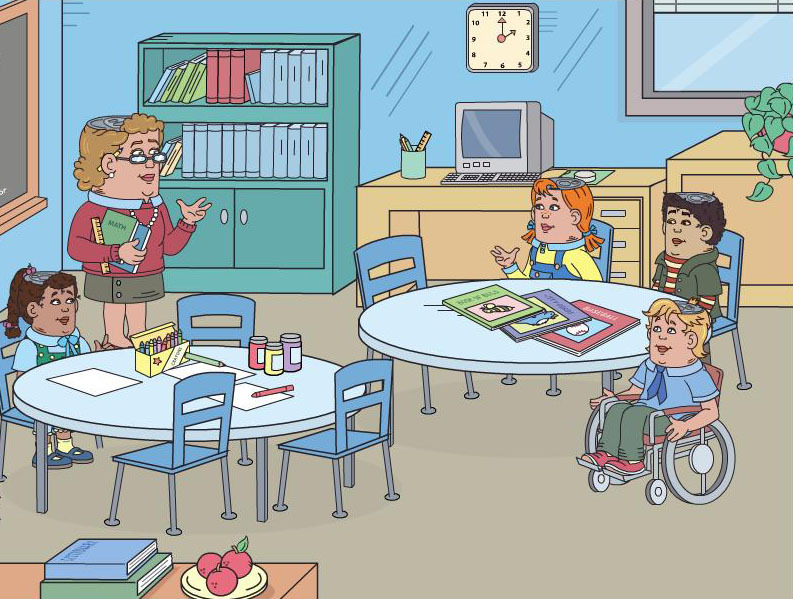 They each took their seats and waited for Miss Pat to call on them for show and tell. Wendy went first. She wrote a story about a dinosaur she called Puff. The class all clapped. Then Willie showed the picture he drew. He didn’t get as much applause as Wendy. When it was Kathy’s turn, she showed the class how to make a dinosaur out of toilet paper rolls and construction paper. Wow…she got lots of applause. Orrie talked about what dinosaurs ate. Soon everyone had a turn but Hector. He went to the front of the room and put a small and a big box on Miss Pat’s desk. 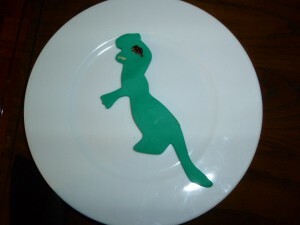 First he opened the small box and took out a dinosaur he made from green play dough. Everyone wanted to know how he had made it. That’s when he opened the big box and said, “I made it the same way I made these cookies…with a cookie cutter I bought in the gift shop at the museum.” Then he gave out a dinosaur cookie to each of his classmates and Miss Pat. Everyone agreed it was the best dinosaur they had ever eaten! Guess who won the book for show and tell. That’s right…it was Hector. He was very nice about it though. He told everyone that after he read it, he would lend it to anyone who wanted to read it as long as they promised to take good care of it and give it back after a few days. The “Can Do” Kids were all excited about the trip they just took to the dinosaur exhibit at the museum. They wanted to talk about what they saw and ask more questions about dinosaurs. Be sure to come back on Thursday to find out what Hector did for show and tell and who won the book ! In the meantime…think about what you would do for a Dinosaur Show and Tell. Grandpa John, What Games Did You Play In the Olden Days? It was a snowy Saturday on “Can Do” Street and very, very cold. Some of the “Can Do” Kids were at Orrie’s for a play date since the snow was too deep for Orrie to get around outside in his wheelchair. Grandpa John and Grandpa Dooley were hanging out with the “Can Do”s, reading stories and playing table games when Hector asked, “Grandpa John, what games did you play in the olden days”? The grandpas looked at one another and smiled. “Shall we tell them how we had fun, John, when we were there age”, asked Grandpa Dooley. “You mean before there was TV and computer games, and DVDs”, replied Grandpa John. Grandpa Dooley began, “Who knows how to play Ringoleaveo”? The “Can Do” faces went blank . “What about Scully”? Again blank faces. “What about Hit the Stick, Marbles, Statues “? Orrie started bouncing in his chair and saying, “I know about marbles”! Just then the doorbell rang. It was Grandma Frances to pick up Hector. “Ohhh, just when it was getting good, I have to leave”, said Hector. OK boys and girls…start asking your grandparents what they played. Be sure to visit our next post when we will have marble games to share! The “Can Do” Kids take good care of their teeth; do you? How many times should you brush your teeth every day? When should you brush your teeth each day? Do you have to brush all of your teeth, or just the front ones? How many minutes do you need spend brushing your teeth? Circle if you should use a …soft bristle…a medium bristle …hard bristle brush… on your teeth? How often should you get a new tooth brush? How many times a day do you need to floss to get stuff from between your teeth that the tooth brush can’t get? How many times a year do you need to see the dentist? How did you do? If you got stuck, ask a parent or big brother or sister to go over your answers with you.